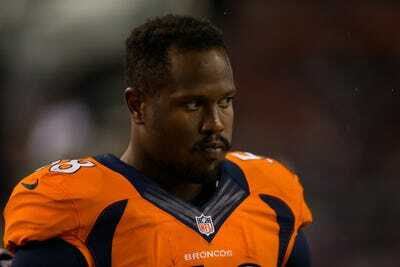 Von Miller and the Denver Broncos are not making much progress on a longterm contract extension. If the impasse continues through July 15, the Super Bowl MVP could potentially sit out next season in order to force the Broncos’ hand — and make himself more money. On Wednesday, ESPN reported that Miller turned down the Broncos’ six-year, $114.5 million offer, which included $39.8 million guaranteed over the next two years. At first glance, that’s a massive number for a defensive player — a hair higher than Ndamukong Suh’s $114.3 million deal with the Dolphins last year. But Miller, deservedly so, wants to be the highest-paid defender in football, and the guaranteed money offered by the Broncos is nowhere near that mark. According to multiple reports, Miller and the Broncos are close on the annual money (somewhere between $19 and $22 million). But aside from the yearly paycheck, and the $39.8 million guaranteed, Miller would reportedly only be able to earn an additional $1.3 million in signing bonuses. In other words, Miller could potentially never see the vast majority of that $114.5 million, as the Broncos could cut him after two years. The guaranteed money is the big hold-up here. For comparison’s sake, Suh — an excellent defender, to be sure — made just under $60 million guaranteed, or $21.5 million more than Miller’s offer. The Chiefs, too, gave Justin Vernon (also a terrific defender) $52.5 million in guaranteed money. Perhaps most jarringly, earlier this offseason the Giants paid Olivier Vernon $52.5 million guaranteed. As Yahoo notes, Vernon may be solid, but he has never made a Pro Bowl and has never averaged more than seven sacks per season. Miller, on the other hand, is not only a Super Bowl MVP, but also a four-time Pro Bowler (in five seasons), and has averaged as many as 12 sacks per season. And so we have a standoff. The Broncos reportedly believe they have the ultimate leverage — and can thus nickle-and-dime their best player — because Miller is still under contract. If the two sides don’t agree to a longterm extension by July 15, the Broncos can, and will, give Miller the franchise tag. Miller could then report, albeit begrudgingly, and play the season. The longterm contract extension, meanwhile, would be pushed back a season. But thanks to a wrinkle in his contract, it seems it is Miller who has the ultimate trump card. As Albert Breer of the MMQB explains, if Miller is willing to sit out for the entire 2016 season, it would force the Broncos to give him a non-exclusive franchise tag. This would allow other teams to make an offer on Miller, which the Broncos would have to match if they wanted to keep their star defender. Presumably at least one team would shell out $60 million guaranteed for Miller (and/or to force the Broncos to write a bigger check). Sitting out an entire season would certainly be a bold, last-ditch bit of manoeuvring from Miller. Which is why it’s unlikely to happen, of course. But simply threatening it could force the Broncos to give Miller the guaranteed money he wants.